Enjoy some of the most remote, scenic and challenging hikes in Nepal passing through the Sherpa homeland of Khumbu in the Everest Region. Take the path less traveled and pass through remote uncrowned areas along a hilly route to reach Everest. We will pass along a tranquil turquoise river viewing the diversity of the region as we change altitudes to capture jungle vegetation, terraced rice fields and snow-capped peaks along the way. Learn the ways of the mysterious Sherpa culture while taking a unique path including all the highlights of the Khumbu Region including sights of Everest, the Gokyo Lakes, Gokyo Ri and timeless untouched Sherpa villages to create the adventure of a lifetime. The region below Lukla is home to the devout Buddhist Sherpa group. This mysterious group is known for their many gompas, ancient traditions and history for aiding travelers on their way to Everest. Further south you will find the Roi people know for wearing colorful lungis, woven vests, khukri knives and golden nose rings. The Roi practice a religion know as Mudam which is an ancient form of Animism performing many rituals with local holy men. 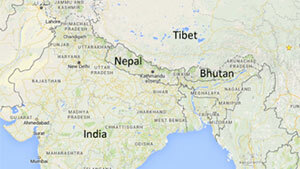 We will take a short scenic flight to Tumlingtar located in Eastern Nepal to begin our trip through the Arun Valley. We will spend the day exploring the small town and its bustling street market before resting for the evening at a local guesthouse. We will begin our journey through the valley following a small path connecting a series of small villages and guesthouses each with their own architecture and customs. Walk alongside mules and locals as we pass a suspension bridge along the Arun River. We continue along the riverside through traditional terraced fields before arriving at Chew Besi for lunch and some rest. We continue until we reach the town of Kartiki Ghat known for its bees and honey as we camp along the riverside. We continue to the peaceful village of Balwa Besi along peaceful streams and a series of local suspension bridges passing through a tropical forest home to a wide range of flora and fauna. We move along a red mud path before stopping for lunch in Charlissay before entering the dense forest along the Irkhuwa River. We cross from Rai to Gurung territory passing several mixed ethnicity villages before arriving in Goethe Bazaar for the evening. We continue through the papermaking town of Dhobani crossing a rusting path before passing over a quaint bamboo bridge. We continue past several simple villages build out of tradition materials with thatched roofs before starting a steep climb past a fishing area passing the famous waterfall steps before reaching Tala Phedi. After a short rest we will continue our tropical hike before arriving at our grassy campsite where we will spend the evening. 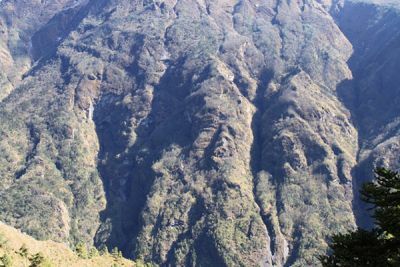 We take a short but challenging hike up to Jau Bari to break up the most strenuous uphill climb into two days. We will reach our Sherpa village destination with plenty of time to make camp offering views of the regions we have previously hiked including Salpa Phedi. We take an early morning climb along a steep stone path offering views of towering hills and terraced fields lying below. We continue through a rhododendron-encrusted forest before stopping to explore a local Sherpa gompa before continuing to Guranse to take in a spectacular sunset over the scenic plateau. 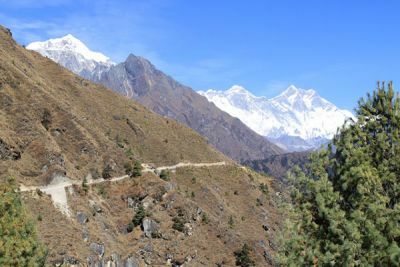 We continue our climb into the Khumbu Region along a windy path before passing through a forest along several mani walls on the way to the Lidung Kohla. We then reach the town of Sanam known as the “land of the sky” by locals famous for its traditional yogurt. We will take some time to explore the village and meet with some locals to learn more about the culture and traditions of the local people. We continue along a winding trail past a traditional fompa at Nimtsola before continuing along the hills and terraces leading to Gudel home to views of several quaint mountain villages. We will take time to explore this traditional village and its charming and hospitable inhabitants. Today we will take a rest to fully explore the scenic and enchanting village of Gudel. Wander around the surrounding areas or chat with some locals to learn more about the town and lifestyle of the scenic mountain town. We begin a long hike past the river over a long wooden bridge before passing the town of Bung on a traditional rock trail. Bung is known for its traditional millet beer and fruit market. 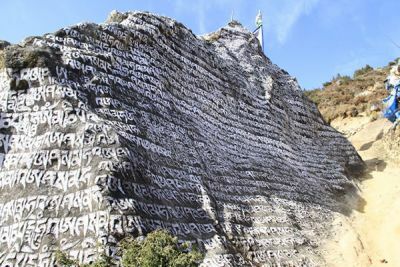 We will continue to past the entrance of the Makalu Barun National Park before reaching a level grassy path on the way to Kiraunle where we will explore the famous and mysterious gompa before making camp for the night. We continue to a scenic mountain crest past covered chortens and mani walls along a rhododendron forest. We reach the Surkie La pass and continue along a ridge offering the best views of Karylung, Khatang and Numbur. We take a steep descent along a bamboo forest to our hilly destination of Najing Dingma offering panoramic views making for a wonderful sunset destination. We continue our trek to the seasonal grazing settlement of Gai Kharka located above the Inkhu Khola River. We move along a very steep bridge and slowly gain altitude passing by traditional Tibetan prayer flags before passing the grassy plateau of lower Shubuche. We will continue to the scenic village of Pangum known for its distinct architecture before taking in a panoramic sunset after crossing the river to Pangum. We continue along a path featuring numerous mani walls along a wooden trail before stopping to rest at the town of Kharte. We reach the Khari La pass offering our first views ofKhumbu Yul Lha, and Gyachen Kang before continuing down a rocky trail to Puiyan. We continue along a small ridge to our destination of Phakepani where we will stay at a friendly guesthouse to stay with a local Sherpa family for the night. We head out on a small pass through the hamlet of Surkhe offering views of the Kongde Massif and Lukla. We continue along a suspension bridge through Lukla and past several fields growing barley, vegetables and potatoes. We connect to the main Everest route at Lukla and will be joined with many more travelers as we continue our ascent through the Khumbu Region. We pass along the Dudh Kasi river along a shaky bridge offering views of the serene gokyo lakes and the Karylung peak. We then arrive in the town of Phakding for some rest at a local guesthouse. This is first scheduled 'acclimatization' day for this trek. It is advisable to stay active and keep moving during the acclimation period to familiarize your lungs with the thing air. 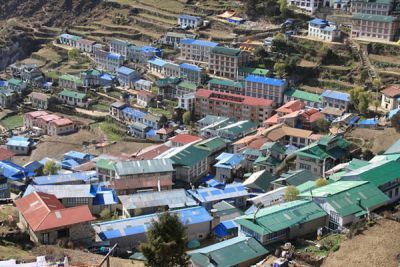 We either spend the day taking a day hike to Thame or visiting Khunde or carry out relaxed exploration of Namche Bazaar itself. Namche Bazzar is the main center of the Everest (Khumbu) region and has government offices, ATMs, Internet cafes, shops, restaurants, a bakery and a colorful market each Friday Saturday evening. 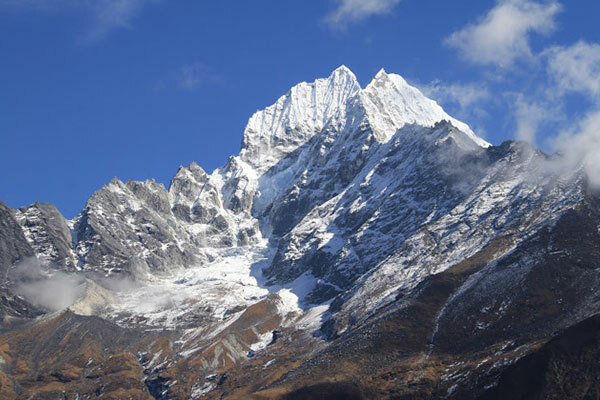 We will travel to the Tourist Visitor Center near Sagarmatha National to learn about the first climbers in Everest, Sherpa culture and the various plant and animal life of the Everest region. We also take an interesting side trip up to Khumjung to climb up to the famous airstrip at Syangboche offering timeless views of the highest mountains on Earth. 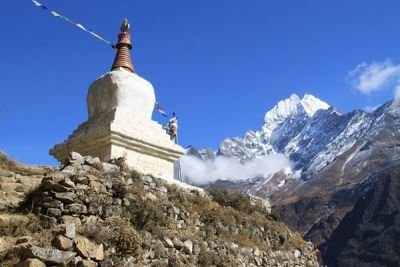 The Khumjung valley is surrounded by the snowy peaks of Kongde and Thamserku and the sacred peak Khumbila which hosts a well-known monastery that houses a yeti scalp. We will stay overnight in Namche Bazaar. We will continue through the traditional Sherpa villages of Khunde and Khumjung along a ridge offering views of Everest, Lhotse and Nuptse. This area is home to many local yaks and scenic gompas so we will continue at a leisurely pace to enjoy the sights. Khumjung is home to a famous monastery, which is home to a Yeti scalp along with interesting mountaineering and religious information. 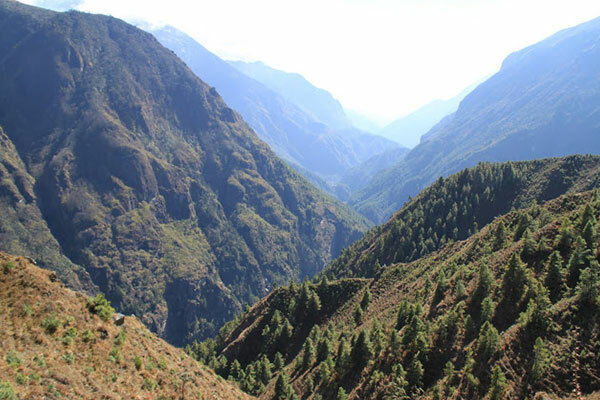 We will then continue along a scenic forest to Kyangjuma to catch a scenic Everest view sunset. Today we continue uphill en route to Dole. The most strenuous ascent of the day comes along the pass to Mong La, a very charming town perched on the base of Mt. Khumbila. An ancient historical Chorten stands at the centre of the settlement where we will stop to admire the views of the surrounding snow-capped mountains and valleys while we have our lunch. The trail offers an abundance of plant vegetation including wildflowers and Rhododendrons while some will spot wild pheasants, mountain goats, and musk deer along the way. As we continue we will pass through forests, water falls and bridges before reaching Dole for the night. We begin by climbing through a scenic ridge above the Dole as the trail passes via Lhabarma at 4220m to Luza at 4360m. The path is steep in most places and surrounded bu thorny bushes on the way to Lhabarma. Offering good views of Cho Oyu, Kantega, and Thamserku the trail takes us through many summer settlements and the charming hamlet of Luza (4360 m). While we ascend from Luza we will see the Dudh Koshi valley, which is a deep canyon with ridged sides. Walking along the path above Dudkoshi while passing through some small hamlets, we reach Machhermo. Machhermo is the last major settlement on the way up to Gokyo. The beautiful stream flowing down from the Kyajo Ri and Phari Lapche mountains runs through the middle of village before draining into the Dudh Koshi. 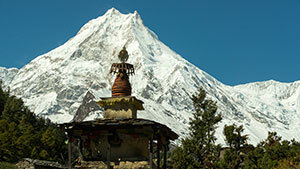 The town is famous as the site where the Khumbu people spotted a Yeti in 1974. We will have the chance to visit the Himalayan Rescue Hospital here for a lecture regarding the altitude sickness, its precautions, and primary treatment. If the weather was not appropriate for Gokyo Ri yesterday it will be completed today. Gokyo Ri is the highlight of this trip. Early morning, we will hike up the to Gokyo Ri (Gokyo Peak). Climbing to Gokyo Ri can be strenuous as the path is steep takes about 3 to 4 hours to reach the top. The hike includes vies of Gokyo village on the edge of lake beside Cholatse and the broad Nogzumpa Glacier. At Gokyo Ri we will be surrounded with panoramic views of mountains like Kusum Kanguru, Thamserku, K 43, Kangtega, Taboche, Cholatse, Makalu, Lhotse, Nuptse, Everest, Changtse, and Pumori. Our Gokyo Ri visit will provide unforgettable life time memories before we continue our trek down to Gokyo for the night. We continue along the west bank of the river along the lakes to the hamlet of Na before crossing along the western side of Cholatse and Taboche. We will stop to admire the perfect views of Cho Oyu and the Valley before continueing to Phortse. 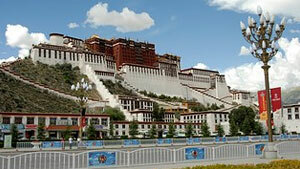 We will visit the famous Phortse gompa before exploring the narrow alleys of the regions oldest village. The trail descends steeply downward so we need to walk slowly and under control as our shaky legs continuously battle the rocky terrain. After crossing the suspension bridges over the fast flowing Dudh Koshi and its tributaries the trail becomes more level and natural. Although we are travelling the same route down, you will see completely different views offering looks at a mixture of open plains, rhododendron and pine forests surrounded by snow covered peaks. We pass through the Sherpa villages' noticing impressive faith in Buddhism and culture of prayer stones and flags along the way. On arrival in Lukla, we will relax before culminating our trek on a happy note with a small overnight celebration featuring local song and dance in Lukla. 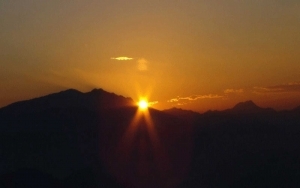 If you schedule allows it you will have a free day to explore the spiritual city of Kathmandu. Wander the backpacker haven of Thamel, visit new temples or do some souvenir shopping at the charming shops. We will arrange a farewell diner for your last night ensuring you try all of the local dishes and native cuisines. Depending on your flight time you may be able to see a few more attractions in Kathmandu before departing approximately 3 hours before the scheduled flight time. 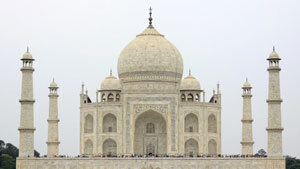 You will be escorted to the airport with a representative from Good Karma trekking staff. After our farewells, you will have plenty of time to plan your next adventure in Nepal with Good Karma, as one time is never enough. Kathmandu- Lukla – Kathmandu Round Trip Flight Ticket .